The Romantic Comedy about a stalker Girl and her Dream Boy. 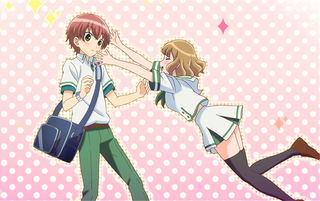 Momokuri Romanceis a web Comic, and The Comico Manga App has streamed a new promo for the afore mentioned title. Yoshimasa Hiraike (Kaleido Star New Wings, AKB0048) is directing the series. the studio behind the work is Satelight (The Disappearence of Bagato Yuki Chan). The Anime will come this Winter.